Well that's just awful. I mean, I know that Johnny Public frequently makes The Wrong Decisions, but - well, just look at the list of One points. And "resolution" coming out on top of the PS4 pile? At least the top reason for the Wii U is reasonable, if vague. Join me, GNamerians. Join me in my rage. Better Resolution - Whilst that is terrific, how does it make a game more fun? Blu Ray Player - Whooppee. I don't own Blu Ray discs, so it isn't really helpful and how does that make it a better machine for games? Game Library - Really? I know this is subjective, but really? I don't see a single game I give a toss about in the library. Faster Processing Power - Yes, that is a good thing, but it ain't what you got, it's what you do with it, so it is more about potential than reality. What Family Wants - Not my family, but maybe yours. Brand - That would be the single dumbest response in history. It is so shallow it is almost as shallow as a Kardashian. That is fanboy personified. Innovative Features - Oh wait, this is even dumber than the last one, I stand to be corrected. What innovation? It is Xbox 360 2. It plays games just like it always has, nothing more. Faster Processing Power - As I said about the PS4. Exclusive Game/Content - Yes, it has some, but probably no more than the PS4. Unless there is a Microsoft owned franchise you can't live without, like maybe Halo, then there isn't much to this. Fun Factor - Completely subjective and if you believe that, then it is true, but seriously, game systems are all toys, all of them and fun factor is the entire point of them. Fun Factor - As I said for Xbox One, but in the case of the Wii U, it generally applies more as the games made by Nintendo tend to be more light-hearted and designed for families to enjoy together. Better For Kids - Unfortunately this just plays into the hands of the immature fanboys who 'think' they have 'grown up' and don't play Nintendo any more. The games the kids enjoy are the same ones the adults enjoy, as they cross age boundaries. I think it generalises to the point of condescension. Price/Value - Well, it should be cheaper as it uses cheaper technology, but really, the price gap isn't big enough to really matter all that much. Backwards Compatibility - Undoubtably true, it gives you access to an instant library of older games if you didn't play them, at a reasonable cost. It is funny that when PS2 had BC, it was talked about with such pride as to the system superiority, then when the PS3 dropped it, the same people claimed it didn't really matter. People always justify their purchasing decisions, but they are not fooling anyone. Exclusive Games/Content - That is the most true statement in the whole stupid survey. It isn't really a discussion as Nintendo are both a major game developer and system creator. However, all systems have exclusive content, just Nintendo has more, keeping in mind that this comes with a price, as it doesn't have many, many games the other systems share, which is why most of us will have a Wii U and one of the others. Laughed when I saw "brand" as the number one reason for owning a One. Fanboyism taken to the extreme. It is pretty awesome isn't it. Oh well, I suppose there are no real reasons to buy one otherwise. Interesting that exclusive content comes up on the One. It's doing better than PS4 at the moment but traditionally I find Playstation to be the real powerhouse of the two for exclusives. Also - and I could be wrong with this - doesn't the PS4 have superior graphics processing than the Xbox One? Yet that's apparently a higher priority for One owners. Odd. Xbox One is the slower beast in nearly every aspect I've sat through many more painful installs for One games and I have fewer of them. Honestly, it's the Xbox One category on this survey that puzzles me the most - I can agree with a few on the PS4 side and a few on the Wii U side, but the One totally boggles the mind on most of its reasons. The worst thing is that, for reasons like this, MS is doing best in the States. To copy Oldschool but looking at slightly more objective way as rember 2 of these are considered all-in-one entertainment systems now. @Balla PS4 is 700,000 in front of the ONE in North America and the ONE has only won 2 months out of 14 but those 2 were very important ones. But NA & UK seems to be the ONE's best regions due to the brand power the 360 had, same in main land EU where the PS4 is dominating due to brand following PlayStation has gotten over the years. That's some consolation, at least. I'd still think that "brand" is a bloody stupid primary reason, though. ...says the Nintendo fanboy, I know, I know. Yeah it is a silly reason but I know from people like I've said because there first real console was a 360 (that makes me sad) that they've stayed loyal and so has the friends. A few would of looked at PS4 instead due to how the ONE was presented & price but that has long since changed. But very much like you if you started on a PS1 instead of the N64 you might of been very different balla. 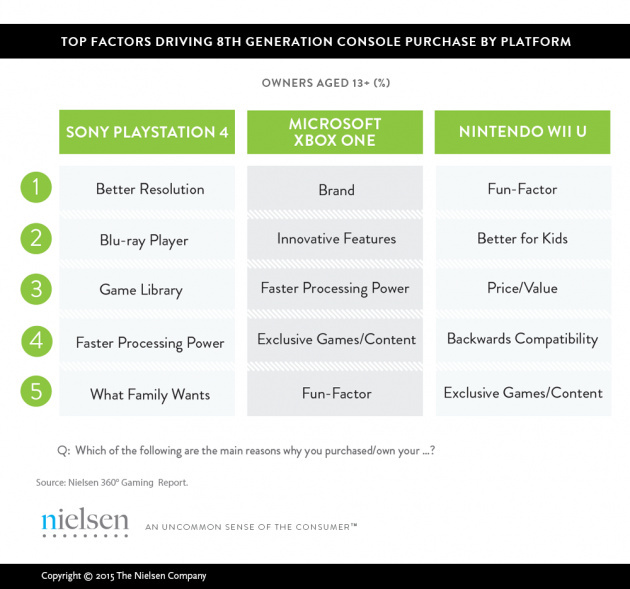 Nonetheless, I'd choose "fun-factor" and "exclusives" far above "brand". I feel that everybody should, if I'm honest - with maybe a nod to "potential" points. I've read all your responses, but I still come to the same conclusion: "Brand" might as well read "derp". I think that the iPhone thing is different, even though brand is still a stupid reason for buying a 'phone on its own. You need a 'phone to call and make texts, maybe browse the Internet and check e-mails in this day and age, and all of them can do that. If we ignore 'phones as gaming platforms, there's not much to choose between them, since they all carry out the basic functions in the same way. But you can't get a Wii U's games on a PS4 or One, and vice versa, and in a few cases you can't get One games on the PS4 and vv. They perform their fundamental task in very different ways. Given that, surely that should be the main reason for acquiring your console? Nonetheless, I don't think anyone's doubting that brand plays a part - just that it shouldn't. As somebody who has owned all three console pillars, presumably you agree. I totally agree and will be getting the 3rd pillar again. And I agree brand is a silly choice but I can see why people do & have bought things for brand. Whilst I agree that most of the reasons given above are not great, but let's flip it around: what are good reasons to buy consoles? The games available on them, and the potential for games available on them. Surely that should be it? I agree, but price is a big factor as well. I almost always buy a console when the games that I want reach a critical mass of viability and the price is at least 40% below launch price. Sometimes there is sufficient games at launch, and a reasonable price, but usually only Nintendo. I waited 6 months for a Wii U and the only reason I picked it was because a store was quitting them and selling them at half price. I probably would have waited over a year from launch otherwise. I picked up a 360 about 3 years into the life for some JRPG and this time, based on previous experience, I won't be picking up a One at all. I just cannot see enough games ever justifying it when any of the JRPGs I want will be on the PS4. I picked up the PS3 about 4 years into it and that was about both price and games. The PS3 was just too expensive and I didn't care abut the Blu Ray player. Enough games to justify it happened first and in fact, I had about 6-8 PS3 games log before I bought the console, but it took a long time to drop in price. I don't expect to get a PS4 until 2016 as then the price will be below the Wii U launch price and maybe there will finally be at least one game I care about. I guess I'm thinking from a value-for-money perspective, although a new console doesn't usually qualify as too major an expense for me (to add some context, I'm soon going to have to start looking for a new laptop. The most expensive console I've ever owned, a £250 N64, will likely be half that price ). You want there to be enough games on that console to make the amount you pay for the platform to be worthwhile. That's one of the pros/cons of primarily gaming on PC. The cost of "buying a new console" - or upgrading your hardware in this case - is higher than console gaming, but there's no concern about having a dearth of games to play, nor a concern about having to pay through the roof for older titles. I'm quite happy with the way Wii U stacks up there. Resolution and brand are rubbish-if-predictable number ones for the other two consoles. A point based on Stu's thought there: 'brand' is stereotypically why Nintendo fans buy their products, but the only response that you could even make seem like brand loyalty was the fifth one. Yeah Nintendo brand is why I bought my DS, Wii, 3DS and Wii U also guess why amiibo are selling as well.